This edited article about trains originally appeared in Look and Learn issue number 889 published on 3 February 1979. Colonial officials on their way to duty in India or Egypt, after taking their home leave in Europe, used to travel in coaches like Victorian drawing rooms on the famed Orient Express. This train, which ran from Paris to Istanbul, made its last trip on 20th May, 1977. With it there ended an era of train travel which, in its heyday, had been glamorous and luxurious, but which, in recent years, had sadly deteriorated. 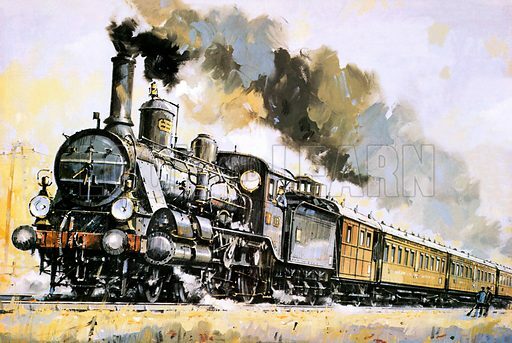 Introduced in 1883, the Orient Express was the brainchild of a Belgian engineer, Georges Nagelmackers. It reigned supreme among the world’s famous expresses until the 1960s, when it began to decline. It finally ceased operating because passengers had deserted it in favour of air travel. Not the least romantic part of the train’s make-up were the engines which hauled it towards Turkey. Our picture shows a Hungarian tandem compound, with outside pipes and steam domes, struggling through the terrain east of Vienna. Faster the plane might be, but the romance of the Orient Express will never be replaced. Wild weather, wolves and other disquieting factors – natural or man-made – were always at hand. Right to the end, the train promised adventure – and often fulfilled its promise.